The countdown has begun. At my 36 week appointment I was not dilated, but at my 37 week appointment yesterday I was 3 cm. As soon as my midwife told me I felt a huge smile stretch across my face. Woohoo! I know this doesn’t necessarily mean I’ll go early, as my sister in law was 3 cm for three weeks and had her baby on her due date. But I personally think little Beau will come early, even if it’s only a few days. Of course, I really want him to stay put until 38 weeks, preferably 39. Time will tell! GENDER: Baby boy Beau. I can’t wait to see if his personality and looks are similar to James Michael or completely opposite. WEIGHT GAIN: 21 pounds as of 37 weeks. I was up to 22 pounds at my 34 and 36 week appointments, but I’ve lost a pound since then. Never thought I’d be on this end of the spectrum worrying if I’ve gained enough weight. But my midwife reassured me that Beau is measuring on track and that I’m fine–it’s just how life is being pregnant with an active toddler. She confirmed he’s head down, and apparently he’s also very low already. Even though I do feel movement very low, I was convinced he hadn’t dropped yet just because of the limited lung space I have right now. I am constantly taking deep breaths just to get enough oxygen in my lungs. My midwife doesn’t think he’ll be a huge baby, but she thinks he’ll be long, which totally explains him being low but still feeling like he hasn’t dropped. 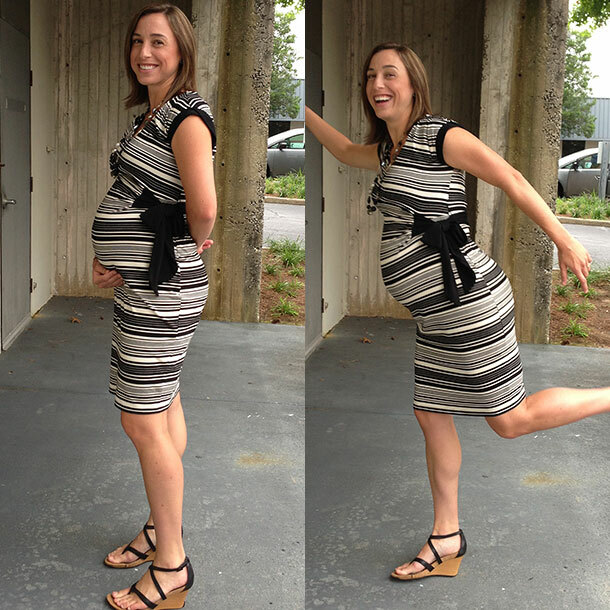 MATERNITY CLOTHES: I’m still living in cotton maternity yoga shorts and tanks when I’m not at work. Still loving my maternity maxi skirt as well. I think it’s obvious to anyone who sees me that I’m in the home stretch–especially since all my maternity clothes are fitted and you can see every curvature of my bump. WORKOUTS: Right now these are still limited to toting around my 25 lb toddler and going on stroller walks with him. I miss CrossFit, but have not found the time to squeeze it in after JM goes to bed. SYMPTOMS: As I alluded to in my post earlier this week, I’m not sleeping well, I’m moving super slow in general and my stomach is super tight–all the time. But I am super thankful that I have yet to swell. I credit that to my large daily intake of water, which was the same before I was pregnant.